Besides the search for the next piece, there are more magical/ mythical creatures they encounter and also a multitude of more personal and character plot lines. It’s actually a great book for character development. One of Ebba’s fathers is acting weird, then another one of her fathers changes after a certain event. One of her fathers tells his story to Ebba. Then Ebba is trying to grow closer to Caspian to see if she can feel something more for him. And she finally figures out what to make of Jagger too. It was great to learn more about the characters and see them go through some more changes. 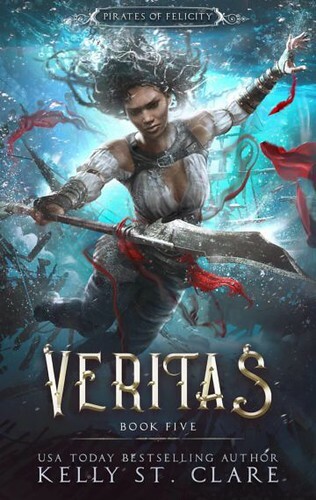 The sword Veritas also plays a big role in this story with how they finally use it’s powers to gain insight in some truths. The title sure if well chosen as a lot is about finding and coming to terms with the truth. And then there is the fifth piece that has some reveals for the characters too. I really like this series with how there’s a big story plot line we’re following with the quest to save the realm, but while the scope is big, there’s also a lot more going on a smaller scope. There are the side characters and magical creatures they meet. And Ebba-Viva’s fathers who all have their own story to Ebba-Viva who grows and changes so much throughout the series. I love seeing how she grows and changes throughout the series, it’s one of my favorite parts. And then there are Caspian and Jagger, both to whom she grows close. While it might seem like it will be a love triangle, it never feels like that. It all develops very natural in my opinion. To summarize: Another great read in this sea themed fantasy series that follows a group of pirates who have to save the world! I enjoyed reading about the adventures that the crew gets up to in this book. Besides the search for the next piece of the weapon, there are also lots of personal and character development plot lines going on in this book. Some of Ebba-Viva’s fathers have troubles. Ebba-Viva discovers more about herself and then there is the romance plot line that makes some progression. This book has some big events and twists and also some new tidbits we learn that I think will turn out to be important for the characters. And with the way things end at the end of this book I am curious to see what will happen next. What’s the last book you read with unlikely heroes? I haven’t read a good treasure hunt-quest style story in a while. I’m glad this one is still going strong for you. Neat how Ebba continues to get to know her fathers and grow closer to both guys while growing stronger herself. Magical creatures sound like a fun added element, too. All around it sounds good. Treasure hunt-guest style story is a good way to describe this one. It’s fun to follow them while they try and find the different pieces. It is a great series and I like how the author developed all the characters. What an interesting sounding story and I really like the cover.